The interview began with a broad opening question about Indian weddings. The informant went on to describe the two-day event. The first day is called Sangeet which takes place in a venue where a reception might take place. However, this portion of the event is before the official ceremony. On this first day, there are many different dance performances and skits from both sides of the family. Most of the performances are from the bride’s side to “show the groom what he is getting himself into…what kind of family that he is getting into.” There are dances for the sibling, aunts, children, friends, and more. Context: Dances are performed by different sides of the family on different days of the wedding. Interpretation: Folk dancing takes on many meanings, purposes, and forms. In India, the bride’s family dances to symbolize the joining of two families. The Sangeet dancing is almost an introduction to her side of the family. During a discussion about Indian weddings, the informant mentioned that the groom is not allowed to see the bride before the ceremony. On the day of the ceremony, the groom and his family travel to the bride in an extravagant dancing parade which symbolizes him claiming her as his wife. Context/Interpretation: Folk dancing is performed for various reasons, and in this case, the dance portrays a traditional action. Further, dancing at wedding is a pretty universal concept, however this dancing demonstration signifies a deeper meaning which the the initiation into marriage. This dance is rite of passage ritual. Sabado de Gloria is whole week or two weeks I believe. This tradition is from Jerez, Zacatecas Mexico. It’s dedicated to Holy Week, Everyday is a different day for a religion which is Catholicism and dedicated to Jesus Christ. It is Special to my pueblo because its a special pueblo its considered a magic pueblo. And do do it because I like the relay JustFab is turned into like a little Advanced more like you can go out and have fun and do the bunch of like musicians and stuff like that. People from all parts of Mexico come over and enjoy all of the festivities like a carnival in the fair. 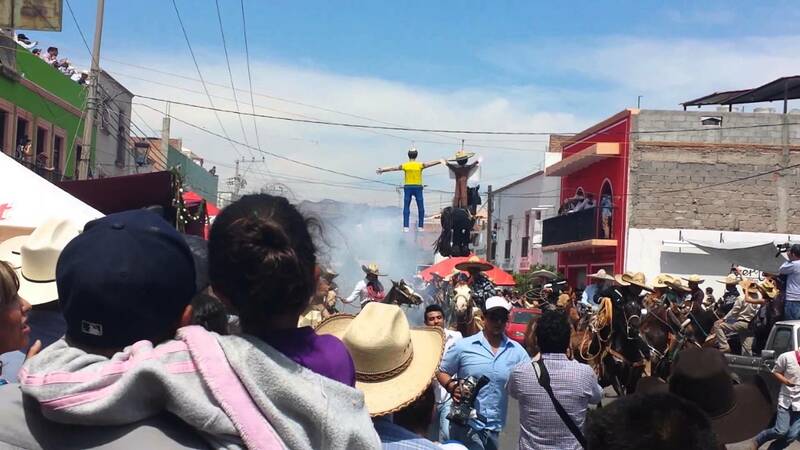 You can ride horses in different parts of the city either a bunch of music and decisions it gets really crowded they have pinatas which is like symbols of the different disciples. When one of the disciples Betrayed Jesus He hung himself so it’s a representation of bringing the disciple in piece. They turned it into a positive thing but have a religious meaning behind it. Sacrifices to remember him and his sacrifice for us. Since the informant is from here he really feels close to this event from his hometown because he goes every year to celebrate it with his family and brings him closer to his culture and his religion. This tradition that happens is very important to that specific town and it makes him feel proud of where he’s from and that part of Mexico. This event is really meaningful to him not just because he gets to be close to his hometown but also to celebrate with everybody from the town and get to know them as well.